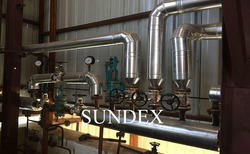 The Vegetable Oil separator are mainly used for continuous degumming. desoaping, dehydration in the process of vegetable oils refining. These series separators, which are used separators repaired and reconditioned and sales and purchase by our works, ore mainly equipments from 30t/d to 300t/d. We offer Edible Oil Plant to our clients. These are used extensively for edible as well as non-edible oilseed extraction. Apart from this, we also offer vegetable oil extraction machinery to our valuable customers. Our products have a crushing capacity of 4 tons/day to 100 tons/day. Furthermore, we also make sure that our product range is duly tested before these leave the premises. The feed oil is heated to 65-70°C in the Economiser by outgoing deodorized oil followed by feed heater in batch refinery (during start up). Liquid Oils are used both as cooking oil and Salad oils. Salad Oil is defined as a clear oil which must not exhibit cloudiness when stored in the refrigerator at low temperatures. Winterization process removes waxes from sunflower oil, saffloweroil, canola oil and corn oil.